A Pair of Micro Suede Dark Brown Window Curtains / Drapes / Panels with Sheer Linen and Valance Set. 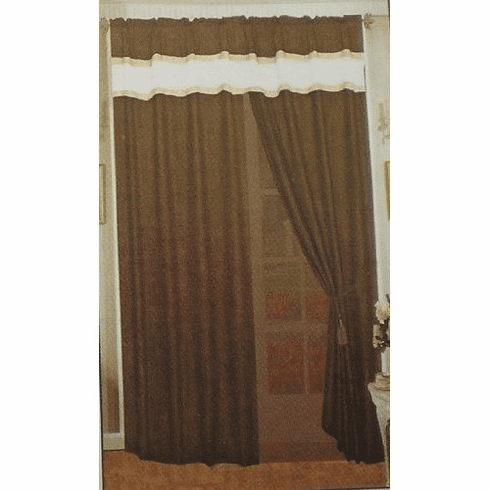 Home | Window Treatment | Window Curtain Valance | A Pair of Micro Suede Dark Brown Window Curtains / Drapes / Panels with Sheer Linen and Valance Set. This beautiful windows curtain set include two panels, each panel has size of 60" Wide and 84" Long. Total 120” Wide. THIS CUSRTAIN SET COMES WITH MUTIPLE COLORS, PLEASE PICK YOUR DESIRED COLOR.